This year, 2014, is the 30th anniversary of the Department! It’s time to do a bit of catching up. It has been 3 years since the previous update. When we last contacted you, we were awaiting delivery of a new Tender [water tanker in civilian speak]. We took delivery of Tender 95 in September 2011. It carries 2100 gallons of water and some impressive firefighting equipment. It is the first brand new truck the department has ever owned. We immediately set out in making it our own and learning all the equipment on it. 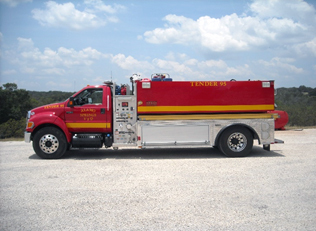 The Tender was financed through a grant from the Texas Forest Service. It is a very capable machine and has proven its worth. We continue to tweak it when we discover improved equipment to add or better ways to use it. Eventually Kendall County plans an exercise in water management for all 7 county departments. The scenario necessitates shuttling water to a remote location over a period of 2 hours to sustain a large volume of pumping. This simulates a major structure fire. We all look forward to participating with the Tender and learning the lessons we know will come from it. In 2011, the Department had also begun planning a new Brush truck with the help and support of many. Kevin Marquardt was the impetus for this project and saw it through to a successful completion. The bed of the truck was manufactured by 4 Comfort High School juniors as their annual project for 2012. They laid it out, cut it, welded it, mounted it on the frame then plumbed it and wired it under the direction of their instructor and Kevin. Folks are still amazed when we show what these talented 17–18 year old youngsters did. It has had a couple of good workouts since joining the Department and performed quite well. We took delivery in May 2012. Our second new truck in 2 years. We expect many years of service from Brush 91. I suspect it could be around for the 50th and possibly our 60th anniversary. On July 4th, 2014 the Tender participated in the annual Independence Day Parade in Comfort for the third time. We like to show it off. I attended the 2012 parade to see it and our new Brush 91 in their parade debuts. We stood behind a group of folks who were obviously from out of town. 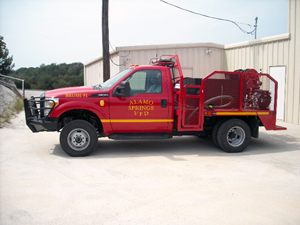 When one lady saw the trucks with Alamo Springs VFD on the side, she asked her friend, “Alamo Springs? Where’s that?” The friend answered, “The Bat Tunnel”. Everyone might not know our name but they do know the Bat Tunnel. For the out of town recipients: The Tunnel area was upgraded to a State Park and last year celebrated its 100th anniversary of the completion of the digging. At about 16 acres, it’s got to be the smallest State Park in Texas. We still have 5 vehicles in the 4 bays. That makes parking a precision job but we have that figured out now. In the spring of 2013, we donated our old Mack Engine to the Texas Forest Service. The Engine was a donation to us from Leon Springs VFD in 2007. TFS has a program set up to pass vehicles and equipment to other departments. That old truck wasn’t beautiful but it found a home up in Wichita Falls at a VFD. They needed an extra engine for structure protection and it filled the bill. I talked with the firefighter who drove it north. The truck maxed out at 55 MPH, so it was a long trip to its new home…. 55 MPH, shades of the Carter administration! We recently spent a couple of work days to upgrade the electrical system in the old building. The circuits were seriously overloaded according to the National code. Not anymore. At the same time, we added two ceiling fans above the area we use for meeting and training. One of these years we may consider adding air conditioning and heat to the building but the lack of both keeps our meetings short in summer and winter. Our latest project is replacing the 1994 Ford F350 van that we use as a Rescue vehicle. That, too, was a donation from Leon Springs VFD in 2007. The van has more than 217,000 miles and is showing its age. We want something that will safely transport more than 2 volunteers and can carry more equipment. We have already found a suitable replacement in the County at Bergheim VFD. They’re upgrading their 4 door, 4 wheel drive Rescue truck with a larger, more capable vehicle. We are currently negotiating with them for a deal. When we conclude the transaction, we will donate the van to the Texas Forest Service to pass on to another department and get to work outfitting a new [to us] Rescue 92. Also of note is an upgrade to our Insurance Services Office (ISO) Public Protection Classification to a split class of 9/10 effective Aug. 1, 2014. This means that all properties within 5 miles of the fire station will be listed in Class 9 and those beyond will still be in Class 10. Bottom line is that those within the Class 9 could see a slight reduction in their insurance rate. We can provide a copy of the new classification letter if you request one.A review of our runs for the past 2 years shows almost half were First Responder calls. We’ve had some calls to locations that were difficult to find, even in daylight. If you have not done so, we ask that land owners please identify your property’s address with prominent, legible numbers. Please recall that we are a tax exempt 501-C (4) organization. Therefore any donation to us is deductible from your taxes. You can also go to: www.alamospringsranch.com and donate via PayPal. Any assistance you can provide will be used judiciously and be greatly appreciated. The drought is not over and there is plenty of fuel for fires, so please be safe. On behalf of all our volunteers, thank you. ← Who has the best hamburger in Texas?